Part military SF, part cyberpunk, part grand-scale space opera, and part techno-psychological thriller, the Cassandra Kresnov novels transcend the recently narrow segmentation of the science fiction genre. In 23 Years on Fire, Cassandra discovered that the technology that created her has been misused in her former home and now threatens all humanity with catastrophe. Returning home to Callay, she finds that Federation member worlds, exhausted by the previous thirty-year-war against the League, are unwilling to risk the confrontation that a solution may require. Some of these forces will go to any lengths to avoid a new conflict, including taking a sledgehammer to the Federation Constitution and threatening the removal by force of Cassandra's own branch of the Federal Security Agency. More frighteningly for Sandy, she has brought back to Callay three young children, whom she met on the mean streets of Droze, discovering maternal feelings she had not known she possessed. Can she reconcile her duty as a soldier, including what she must do as a tactician, with the dangers that those decisions will place upon her family--the one thing that has come to mean more to her than any cause she now believes in? 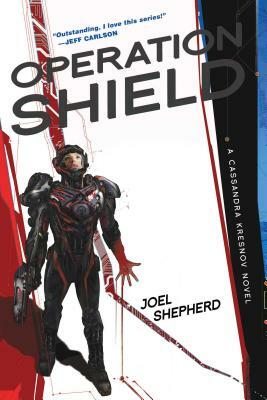 Joel Shepherd (Adelaide, South Australia) is the author of four previous Cassandra Kresnov novels--Crossover, Breakaway, Killswitch, and 23 Years on Fire--and four novels in the Trial of Blood and Steel series--Sasha, Petrodor, Tracato, and Haven. He is currently midway through a doctoral program in International Relations, and has also studied film and television, interned on Capitol Hill in Washington, and traveled widely in Asia. Visit him online at www.joelshepherd.com.